July 22, 2012 marks the 111th birthday of Charles Weidman.!!! (quoted in Janette Lancos’ “Reclaiming Charles Weidman”). Charles in his masterpiece Bargain Counter (photo by Frank Derbas). 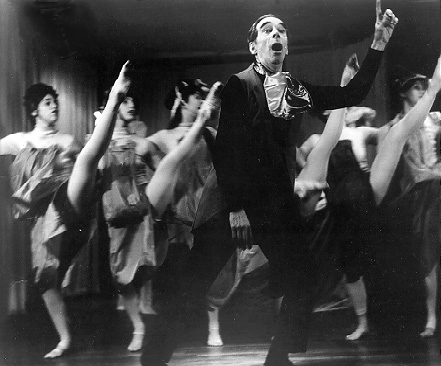 Carry On is designed to continue the eductation of historical modern dance, centered around Charles Weidman’s influence and relevance in the dance world today! The Charles Weidman Dance Foundation has created this blog as a way to continue educating today’s dancers on historical modern dance forms and finding relevance within the generational gap. Within this blog we plan to share stories remembered by Weidman alumni, articles and books about the Weidman legacy, happenings in the dance world today with ties to historical modern dance, retrospectives on the foundation’s past events, and updates on the foundation’s current activities. For our first post, we’d like to give you a quick history lesson on the Charles Weidman Dance Foundation’s beginnings and catch you up to speed with where we are now! Before we were the CWDF, we were the Charles Weidman School of Modern Dance, Inc (1968). We have functioned continuously since then dedicated to keeping alive the heritage of Charles Weidman: one of the giants and pioneers of American modern dance. After Mr. Weidman’s death in 1975, the board was initially charged with a great responsibility: maintain Mr. Weidman’s company and school, foster his goals of creating and presenting dances, continue to develope the Weidman dancers, and create interest in modern dance. It was 1990 when the Foundation coined its current name The Charles Weidman Dance Foundation, Inc. and while the company and school no longer exist, the mission and goals of the Foundation remain the same – to reconstruct, present, and preserve the work, principles, and legacy of Charles Weidman. Check back soon for insight into the last few years of CWDF activities and what we think the future holds for historical modern dance!